When Gabriel Gai, a state minister for South Sudan, visited Uror county he was on a mission for peace. There were violence and cattle raiding in the area, things that have been ongoing throughout South Sudan’s Jonglei state for years. He asked the people to put down their weapons and not to fight. What did the community ask of him? They asked for food. Hunger has resulted from years of conflict in South Sudan, starting with the war with its northern neighbor Sudan. More recently it has come from the internal conflict that has killed and displaced thousands of people. The Lou Nuer and Murle tribes have fought vicious battles, each one leading to another conflict. As Confucius once said, “Before you embark on a journey of revenge, dig two graves.” Such is the story of war in South Sudan. There is a cycle of hunger, poverty and violence that holds South Sudan back, particularly in Jonglei, the largest state. Each week reports come in of more violence and suffering among the population. The UN said last week, “The security situation remained tense in Jonglei during the week. Several incidents of armed hostilities between the South Sudan armed forces and non-state armed actors were reported in and around Pibor town.” Thousands of people have been displaced by fighting there this year. Catholic Relief Services (CRS) is on a mission to end hunger and build peace in South Sudan. As an aid agency they know that this puzzle must ultimately be solved by the citizens themselves. That answer lies in producing food, unleashing the potential of the farmlands of South Sudan. The plan is to make South Sudan less dependent on international food aid. This means education and training in agriculture. Sara Fajardo of CRS listened to what the people had to say. They want to farm. They just need a little help to recover from the ruins of war to get started. Uror County is one area benefiting from the CRS food security program. Getting people to put down their guns and focus on farming is the key to peace. 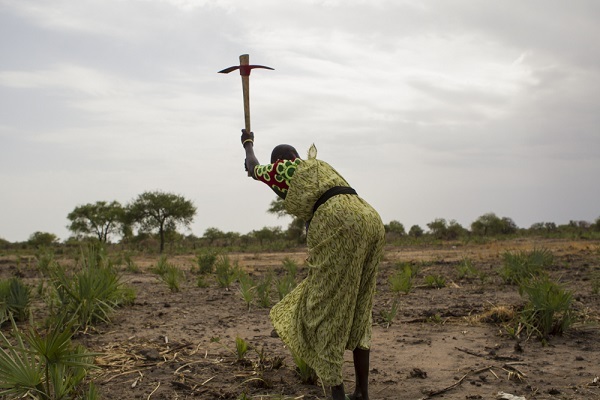 The United Nations Mission has disarmament programs that also focus on farming to help reintegrate former soldiers and their families back into society. You can’t build a society on guns, but you can with farming and food. The UN World Food Programme is helping South Sudan build a nationwide school lunch program. What could be better than having South Sudan’s own farms provide the food for these school meals? Read more from the voices of South Sudan talking about ending hunger.